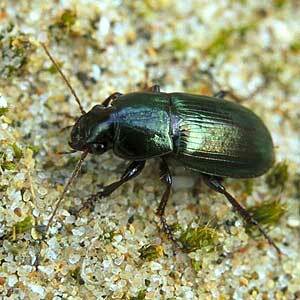 Description: An 8.5-12mm long black beetle with colourful and varied metallic reflections. 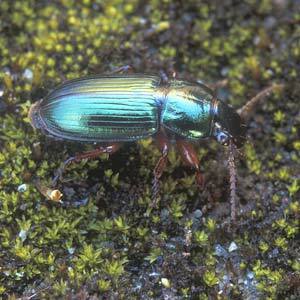 The male is usually metallic bronze, green or blue, the female usually unmetallic black. Phytophagous. Common in dry grassland and coastal dunes. World Distribution: A Eurasian Wide-temperate (65) species and found across Europe except the extreme north, south to Asia Minor and Iran, and east to the River Lena in Siberia. Introduced in N. America. Irish Status: Like the majority of Harpalus, this species is of restricted distribution due to the scarcity of free-draining soils, particularly in the west. Its range appears to be entirely coastal except for a few inland sites on sandy or morainic soils. Ecology: Fairly eurytopic in areas which suit it, on arable land, in quarries, on dry grassland and on sand dunes at or near the coast.